Our team can help in times of crisis. Let us take the burden of dealing with the legal hassles so you can tend to your personal family needs. We offer a free phone consultation up to 30 minutes at the beginning of work. Many people find themselves unable to travel to our offices to meet with an estate planning attorney. When this is the case, our attorneys will meet with them at the location of their choice. Payment of a deposit must be made in advance of the appointment. Payment may be made by the client’s family members or friends, but all of our services and duties will be to the client alone, even when another person has paid. 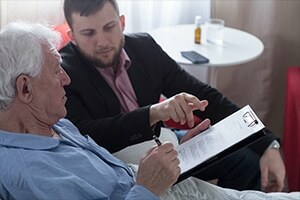 If the client dies prior to signing the estate planning documents or, in attorney’s sole opinion, lacks capacity to execute such documents, attorney’s fees will be limited to the actual time expended on the matter, plus travel time, at the current hourly rates of the attorney and staff involved. In such cases, the person who made the deposit will be reimbursed promptly for any overage. If you or a family member needs emergency estate planning, the estate planning attorneys at Sowards Law Firm can help relieve your stress. Contact our firm today at (408) 371-6000 to get started.